• Heat little oil in a pan over medium fire. Fry chopped onion and then add brown sugar. Mix well and add tomato juice, tomato sauce, dry mint and mustard. Toss well and leave to simmer on a low heat until it boils. Set aside to cool. • Brush a tray with oil and place chicken breasts side by side and cover with the ready tomato sauce. • Place the tray in oven of 180 degrees until the chicken breasts are well cooked. The upper flame of the oven can be switched on in the last five minutes. 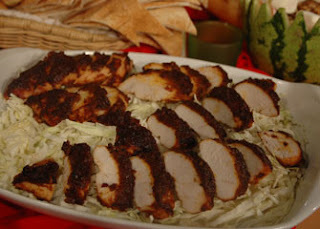 • Cut the chicken in slices and serve, either hot or cold.